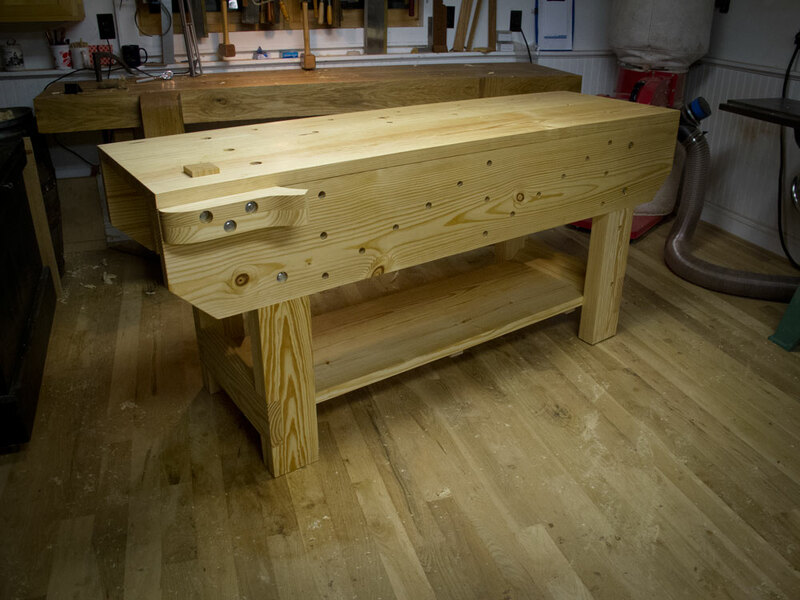 I’m teaching two classes in building the Knockdown Nicholson Workbench in 2015 (details on the locations to come) and needed to prepare a list of materials and tools for the students. Because I received an S+ in “Sharing” in kindergarten, I am also posting it here. Ductile mounting plates for 3/8” x 16 threaded rod. You need 16. Available from McMaster-Carr. High-strength steel cap screws, 3/8” x 16 thread. You need 16. Available from McMaster-Carr. Plain steel 3/8” flat washers. You need at least 16. Buy a pack of 100 from McMaster-Carr. Plain steel split lock washers, 3/8”. You need at least 16. Buy a pack of 100 from McMaster-Carr. No. 10 x 1” slot-head screws (for attaching the mounting plates). You need at least 32. Buy a pack of 100 from McMaster-Carr. No. 8 x 2-1/2” wood screws to assemble the ends. A box of 50 should be fine. Here’s a link to the square-drive ones from McMaster-Carr. No. 8 x 1-1/4” wood screws for attaching the interior apron bracing. You’ll need about 20. You can also buy these from McMaster-Carr. Gramercy Holdfasts. One pair. Available from Tools for Working Wood. For a 6’ or 8’ bench, I recommend you buy four 2x12s that are 16’ long. Buy yellow pine or douglas fir, whatever is available in your area. Buy the clearest, straightest stock in the pile. (And if there’s another 2×12 there that looks good, grab it too.) This will allow you some waste and to cut around knots, shakes, pitch and ugly. Note that this does not include the shelf – add a 2×12 x 16’ if you want a shelf. Yes, you will have leftover wood. You will also need 1×10 material for the interior apron bracing. For a 6’ bench you can get one 1×10 x 8’. For an 8’-long bench, get two. 9/16” socket set to assemble and disassemble the bench. 3/4” WoodOwl Nailchipper bit. Get yours at Traditional Woodworker. Forstner bit. You’ll need 1-1/8” for the counterbores. Brad points. Bring your set. Bench building is a lot about drilling holes. Tapered countersink bits. The Snappy set from Woodcraft is good. A pair of sawbenches or sawhorses to work on. (Barring that, a couple of 5-gallon buckets). This entry was posted in Woodworking Classes, Workbenches. Bookmark the permalink. Putting aside the fever of current infatuation, which knockdown bench do you prefer, the Nicholson, or the Moravian? The one that allows you to easily work on the edges, ends and faces of boards…..
Did you use a 2×12 for the shelf? I didn’t catch that – I did one out of 1x material. Though the 2x will certainly add more mass :). Thanks for this design – it came at just the right time for me! teaching at a southern location previously on sabbatical????? I apologize if you have already covered this: On some Nicholson benches the front apron is let into the legs with an angled notch; I assume this is for added rigidity. Is there any benefit to doing this, or with modern fasteners does it now really boil down to an aesthetic choice? Can’t say. I haven’t let the legs into the apron that way. McMaster Carr should make up a “kit” for you. Thanks to you I spend more time in their catalog… It like old hardware stores used to be. Did you plane the faces of all the wood, or just flatten the top and joint the edges of the other boards. Looks like Mike only flattened the top in “The Naked Woodworker”. I planed everything. Can’t help myself. Mike worked straight from the stock from the home center. We ended up at the same place: with a functional workbench. This kind of specific advise (complete with links! ), necessary and helpful, yet so precious and rare, is what makes you the one-in-a-bazillion! Thank you for your kind generosity! This is why, when I need a book, I will buy it from you. Why do you use slotted screws to attach the metal plates and not square drive as elsewhere? Aesthetics. The screws for the iron plates are quite visible. The smaller screws are mostly hidden. You get an S+++ from me. For the top, what is the best way to glue the boards to build up the thickness? Glue and screw? Per Mike’s DVD, predrill they through hole to the thread diameter of the screws you use. That really lets the screws act like clamps! Sorry one more question. In making an 8ft version, should the base dimensions remain the same with the added length accommodated in the overhang of the ends. Or would it make more structural sense to increase the distance between the legs sections? Trying not to over think this but can’t help myself. I’d make the overhang the same on the ends – essentially adding the 2′ between the legs.